Not surprisingly, big U.S. companies have taken advantage of the skills and connections of ex-diplomats who used to protect and advance the country’s interests abroad, and hired them to promote their corporate interests. Half a dozen of those former diplomats in their 30s and 40s, who were considered among the best by both peers and superiors, said they would have preferred to remain in the Foreign Service — most likely until retirement. But the administration’s attitude and actions made it impossible to continue serving. They also said they have disagreed with both Republican and Democratic administrations on certain issues or policies in the past, but once decisions were made, they implemented them professionally and conscientiously. As public servants, they learned to leave their personal views aside and support the presidents the American people elected — but also to uphold the constitution. This is the main difference today. “I have concluded that defending the constitution and performing the duties of my office in an executive branch under Mr. Trump are incompatible,” T.J. Lunardi, one of the first to exit the Foreign Service after the 2016 election, wrote in his resignation letter. He called his decision to leave “among the most difficult and painful” in his life, but “a moral and ethical necessity in the face of someone I judge to be so clearly inimical to the values I have sworn to protect.” Up until Lunardi’s departure, the State Department was the only employer he ever had. He joined the Foreign Service at 22 in 1999 as a political officer, but after his first tour in Amman, Jordan, he decided to become an agent in Diplomatic Security, the department’s law-enforcement arm. In that capacity, he served in Iraq, Germany, Britain and Ukraine. Other former diplomats with promising careers who have stepped down in the last few months have since been hired by U.S. companies with a global presence in such industries as technology, pharmaceuticals, personal-care products and management consulting. They said their new employers value their experience living and working in foreign cultures, dealing with foreign governments, understanding today’s complex international relations, as well as their analytical, negotiation and public affairs skills. “Smart companies pursue their own foreign policies,” one ex-diplomat said. He and others asked that their names not be used, because they work with the U.S. government in their new positions and don’t want their companies to be affected negatively by their criticism of the administration. The exit of midlevel and even junior officers from the Foreign Service earlier than they expected when they first joined is hardly a novelty. Some realize they are not cut out to live overseas and to move around every couple of years. Others — or their family members — develop health conditions that result in revoking their medical clearance. Yet others find the bureaucracy too clumsy and limiting, the culture too risk-averse and discouraging innovation. One of the biggest complaints for years has been about the difficulty of Foreign Service members’ spouses to secure employment abroad, which leaves families with a single income. The lack of diversity — over 80 percent of diplomats are white — has been another longtime problem. What is different now, along with the higher number of resignations, is the reason why diplomats are leaving. 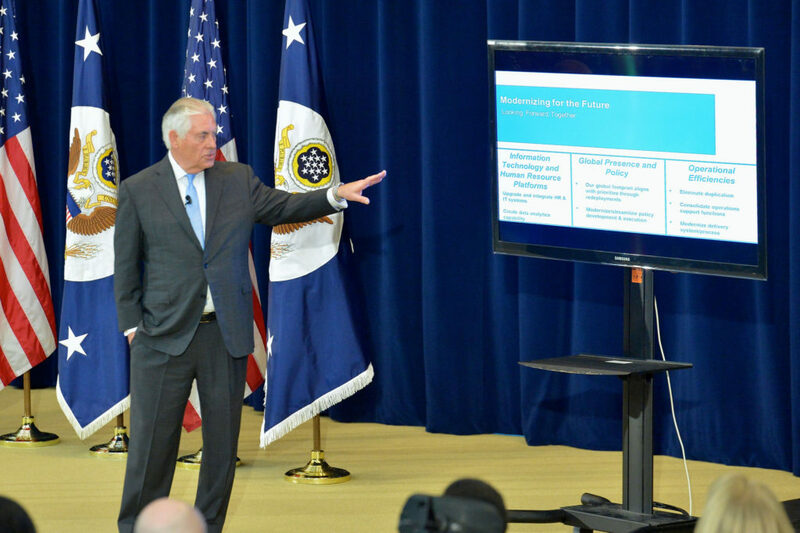 In recent years, the State Department has actually made some progress in addressing the employment and diversity concerns, hiring more spouses at overseas posts and recruiting more minorities. Since 2012, it has scored either third or fourth in the annual ranking of the best places to work in the federal government by the Partnership for Public Service. According to the 2017 results, released last month, it has fallen to eighth place, its score having dropped more than that of any other agency. All career diplomats aspire to rise to the ranks of the Senior Foreign Service — the cadre that has advised U.S. presidents on the most challenging foreign-policy matters for decades and led the implementation of some of the most momentous decisions in our history. They prepare for that throughout their careers despite the difficulties they have to endure, such as living in heavily polluted places and serving in war zones. So resigning, especially when you are on the cusp of joining the senior ranks, is a very big deal. I asked yet another former officer whether, in order to avoid resigning, she could have found a place at an embassy abroad or in an office in Washington that is unlikely to cross the White House’s radar screen and wait out the administration? “I wasn’t there to keep my head down,” she said. Some of the work ex-diplomats now do in the private sector — providing advice on international developments and engaging with foreign governments to resolve problems or take advantage of opportunities — is somewhat similar to that in the Foreign Service. But the fact is, working as a U.S. diplomat can’t truly be replicated anywhere else. Still, a new trend is emerging. While corporate bosses have aggressively recruited political appointees at the State Department for years, they have hardly ever poached Foreign Service officers — maybe just few facing retirement. Perhaps those executives don’t quite understand the value career diplomats could bring to their companies. Or perhaps they know how difficult it has been to persuade Foreign Service officers to quit their jobs — until now. Whatever the case, if the current decapitation of American diplomacy continues, expect more Foreign Service expertise to find its way to the private sector. After all, a professional diplomat with 10 or 20 years of experience is a much bigger asset than a political appointee who spent a couple of years in a State Department position with a fancy title as a reward for working on a political campaign. Many of the recently departed diplomats are members of ethnic minorities. They speak such hard languages as Chinese, Arabic and Farsi. Our government made million-dollar investments in them. Losing those officers at a time when the State Department is struggling to attract a diverse pool of Foreign Service applicants — or any applicants, for that matter — is worse than shortsightedness. It’s mindlessness. Many in the Foreign Service have the impression that Trump doesn’t consider public servants very smart, believing instead that really smart people go into business and make a lot of money. Perhaps he will have more respect for the diplomats now in the private sector. But with a newly unveiled National Security Strategy, I wonder who he thinks will lead its implementation, if not diplomats. This entry was posted in Diplomacy, Latest and tagged American diplomats, diplomats, Foreign Service, private sector, Starbucks, State Department, Trump administration. Bookmark the permalink. ← Does America Need Professional Diplomats?